(CNN)Crowds of pro-government supporters demonstrated Saturday in Iran after two days of rare anti-government protests which spread to a number of cities. Nearly 2,000 people gathered peacefully in the capital, Tehran, in support of the government’s policies, an eyewitness there said. 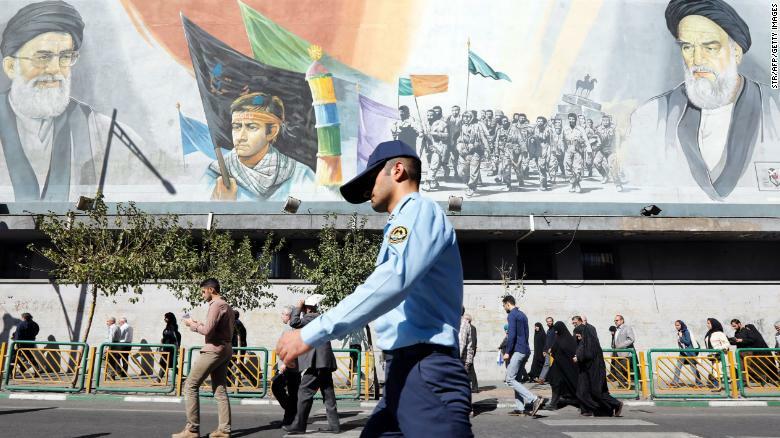 State-run Iranian broadcasters showed demonstrators waving the Iranian flag at the pro-government rally, which had been scheduled before the anti-government protests broke out. Meanwhile, coverage of the anti-government protests was very limited on state-run media, which referenced them only in passing. The protests — described as the largest public display of discontent since the 2009 Green Movement in Iran — have emerged against a backdrop of rising food and gasoline prices. Some arrests have been reported in Iranian media. Iran’s Interior Ministry has warned against “illegal” public gatherings, saying any groups wishing to gather must file an official request and be granted permission. A statement posted on the Foreign Ministry website said the Iranian people gave no credence to such “opportunistic” remarks by US President Donald Trump or his administration and described “Mr Trump’s government” as the main source of ill will toward Iran. Demonstrations in the northeastern city of Mashhad on Thursday prompted protests that spread to cities across the nation on Friday. They were documented in Tehran, Kermanshah, Arak, Qazvin, Khorramabad, Karaj and Sabzevar, according to First Vice-President Eshaq Jahangiri, cited by official Iranian news agency IRNA. Protesters have been heard on videos distributed on social media as chanting “Death to Rouhani,” a reference to Iran’s President Hassan Rouhani, who was reelected earlier this year, but CNN cannot independently verify the authenticity of the footage. Some protesters in these videos also pointedly targeted their ire at Iran’s Supreme Leader Ayatollah Khamenei — a rare display of dissent, and something not widely seen in the pro-reform Green Movement protests, which disputed the outcome of that year’s presidential elections. Poorer Iranians have been involved in the new round of protests in a way that wasn’t seen in the 2009 Green Movement, an eyewitness in Tehran noted. Iran currently sits 120th on the World Bank’s Ease of Doing Business Index, demonstrating the difficult economic situation in the country. The high youth unemployment rate is of particular concern for Iranians. US President Donald Trump subsequently tweeted the same message. “Iran’s leaders have turned a wealthy country with a rich history and culture into an economically depleted rogue state whose chief exports are violence, bloodshed, and chaos,” said spokeswoman Heather Nauert. “As President Trump has said, the longest-suffering victims of Iran’s leaders are Iran’s own people. Relations between Washington and Tehran are currently tense, with the Trump administration critical of what it sees as Iran’s growing regional influence and alleged involvement in conflicts including Yemen and Syria. Rouhani won a landslide re-election in May after campaigning largely on social reform. His campaign also touted the merits of the 2015 nuclear deal with the United States, the European Union and other partners which has been rejected by Trump. “Unfortunately, most of the people who participate in these gatherings are unsophisticated individuals who are not aware that these calls for protest are made by anti-revolution elements,” Mohsen Hamadani, Tehran deputy governor in charge of security affairs, was quoted as saying by the semi-official news agency ILNA. Protesters have been temporarily arrested for participating in “illegal demonstrations,” according to Hamadani, who said the demonstrators had not officially applied for permits to demonstrate. The New York Times’ chief diplomatic correspondent Steven Erlanger told CNN that the demonstrations were to some degree against Iran’s involvement in Syria and other places, with protesters saying that the money spent there would be better used at home. But, he said, the discontent also seems to be being fomented by opponents of Rouhani, a liberal in the Iranian context who backed the 2015 nuclear deal on the promise that sanctions would be lifted and life would be better for all Iranians. That promise has proven difficult to live up to, in part because of the Trump administration’s opposition and partly because foreign companies are wary of being punished by the American banking system for doing deals in Iran, Erlanger said. While sanctions against Iran were eased under the 2015 deal in exchange for curbs on Tehran’s nuclear program, US sanctions imposed over non-nuclear activities continue to have an impact. CNN’s Natalie Gallón and Gul Tuysuz contributed to this report.